This very much comes into the 'I wish' category! From 1 to 15 August 2015 Musique Cordiale runs in the hills between Nice and Aix-en-Provence. 100 musicians will pour into the village of Seillans to embark on two weeks of intense music making. There will be 27 concerts taking place in 11 villages, including 9 free lunchtime concerts, 3 orchestral concerts, 3 outdoor opera performances and a number of late night recitals. Mark Austin conducts Puccini's Tosca with Laura Parfitt, Leonel Pinheiro and Adam Green, directed by John Savournin of Charles Court Opera (see my interview with John). Graham Ross, director of music at Clare College, Cambridge, conducts Haydn's Creation with Lydia Brotherton and Andrew Staples. The choir will also be performing a programme of double-choir music by Rheinberger and Frank Martin. James Lowe,Chief Conductor of the Prussian Chamber Orchestra, will conduct the orchestral concerts with music by Bach, Tchaikovsky and Brahms as well as a baroque programme. Brahms double concerto will be played by Chiara Enderle, winner of the 2013 Lutosławski and Pierre Fournier awards, with her father Matthias Enderle, leader of the Swiss Carmina Quartet. 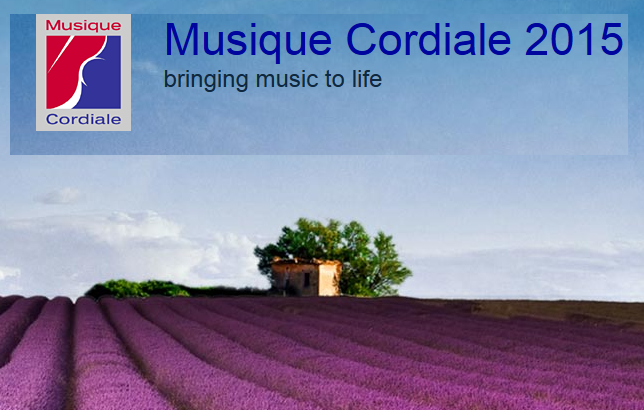 Full information from the Musique Cordiale website and it is even possible to participate so that's an idea for next year too.